Applications for grants are considered on merit. Trustees do not often give grants to government organisations. Instead, they support independent institutions, in particular schools, hospitals and health centres associated with Missions. Trustees seek to maintain, as far as possible, an equitable distribution of grants between Zambia, Zimbabwe and Malawi. Strict rules are applied to infrastructure grants, to ensure that detailed and serviceable plans are submitted before a grant is paid. A proportion of the money is routinely withheld until the Trust is sure that a project can be satisfactorily completed, within or below budget. Regular visits within the beneficial area by Trustees, Correspondents, the Representative and the Secretary allow an application to be judged before Trustees consider it; reviewed while under construction; and assessed when finished. ITSA is a registered charity which supplies schools in the three countries with refurbished computers, donated by UK firms. Several thousand computers have so far been sent to schools in the beneficial area, including this one at St Mary’s Girls’ School in Zomba, Eastern Malawi. The Beit Trust provides substantial and ongoing core funding for this project. BAI is a registered charity which supplies a very broad range of books, educational materials and assistance to beneficiaries in developing countries worldwide. The Beit Trust makes a major annual grant to cover delivery and distribution costs to the three countries of the beneficial area, including this one in the Malawi National Library, which was originally built in 1978 with funds provided by the Beit Trust. In 2018, BAI provided over 300,000 books to the three countries. The only significant black rhino population in the beneficial countries is in Zimbabwe. They remain endangered by continued poaching and encroachment on reserves. In 2018, Trustees allocated a further £10,000 to the Lowveld Rhino Trust. The Beit Trust has provided financial support for two decades to facilitate the distribution of the publication “Tropical Doctor” to every hospital and clinic in the Beit beneficial area. 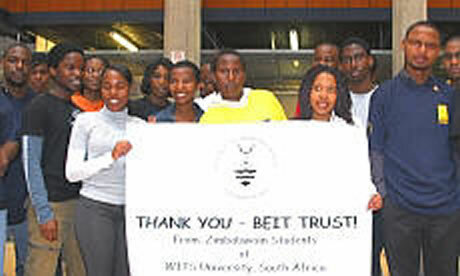 In addition to sponsoring postgraduates, The Beit Trust provides grants to secondary and tertiary education. Because of the expansion taking place at all education levels in the three countries, any Beit Trust involvement with secondary schools is ordinarily restricted to help with construction projects. In Zimbabwe, however, not all schools can use infrastructure grants under present circumstances, so a number of interim alternatives have been introduced to support education in other ways. At several South African universities, The Beit Trust has established a temporary fund for the emergency relief of selected Zambian, Zimbabwean and Malawian students, who are assessed to be facing severe financial hardship. The Beit Trust also grants considerable sums towards the provision of books in the three countries. In addition to working through Book Aid International, the Trust works with Biblionef, an educational charity based in Cape Town. They provide, upon request, book packs of about 750 books to many schools in the three countries. The University of Zimbabwe Library, which received a grant of £50,000 from The Beit Trust, used the funds to establish a Collaborative Learning Centre, Postgraduate Computer Laboratory and provide for refurbishment of the Seminar Room in the Main Library. 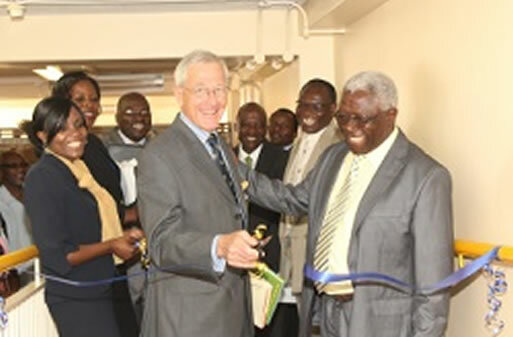 The facilities were officially opened by UZ Vice Chancellor, Professor Levi Nyagura, at a ceremony attended by the then Beit Trust Representative, Mr Tim Johnson (below). The Trust’s policy is to support health, educational and welfare projects which fit into the pattern of the country concerned. Grants are mainly given for infrastructure building, and other similar purposes. These include grants to institutions dealing with the aged, as well as the physically and mentally handicapped. 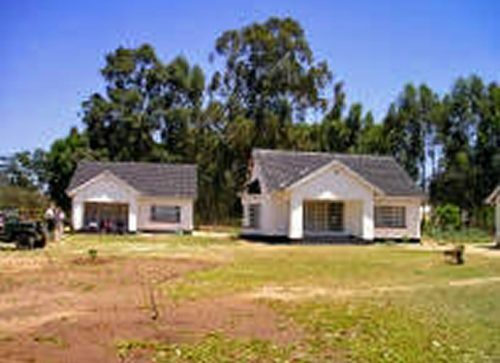 Two nurses' houses at Borradaile Hospital, Marondera, Zimbabwe. A Beit Trust grant for a new building, or to reconstruct an existing building at a mission school, hospital or clinic, seldom exceeds £50,000. On occasion, however, larger grants are given in special circumstances. The universities in all the beneficial countries have benefited in this way, and the Malawi National Library and Beit CURE Children’s Hospitals in Malawi and Zambia were built with major Beit Trust grants. Beit Bursaries are also awarded to help British medical students with the cost of spending six to eight weeks working in hospitals in the beneficial area. Started in 2007, the scheme’s success has led to a similar but bigger scheme assisting selected UK junior doctors and surgeons to undertake secondments of at least six months at hospitals in Zambia, Zimbabwe and Malawi. Provision for destitute old people is often funded. This is currently particularly important in Zimbabwe. For some years, the Trust has supported educational and extension projects related to environmental issues. In 1990, conscious that the number of black rhinos in the wild was diminishing rapidly, the Trust made a large grant to help conserve the species. Two large conservancies were set up in Southern Zimbabwe. The Trust funded substantial fencing to encompass them, as well as aircraft, vehicles and radios. The black rhino population in the conservancies is increasing and the project has been seminal in ensuring their survival and continuing genetic diversity. The next stage in the programme is the reintroduction of rhinos to selected game parks, once proper protection and management are available. 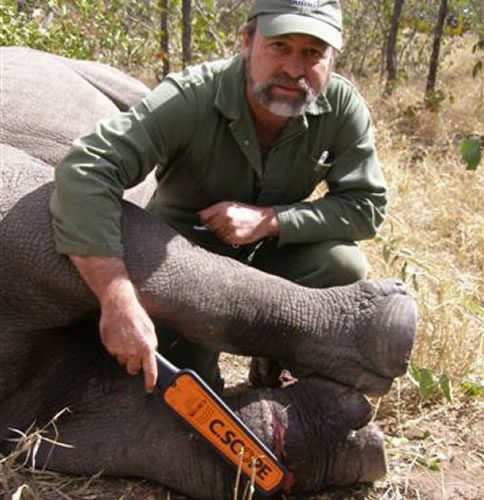 Field surgery being undertaken to free an anaesthetized rhino of a wire snare embedded in one of its legs. Without such treatment, the rhino would slowly lose its foot and death would follow. To commemorate the 100th anniversary of the establishment of The Beit Trust in 1906, the Trustees decided to award a major grant for an infrastructure project in each of the three beneficial countries. They also commissioned a Centenary book (see History page) to commemorate the last 50 years, as a follow-up to the original 1956 book, “The Will and the Way”. 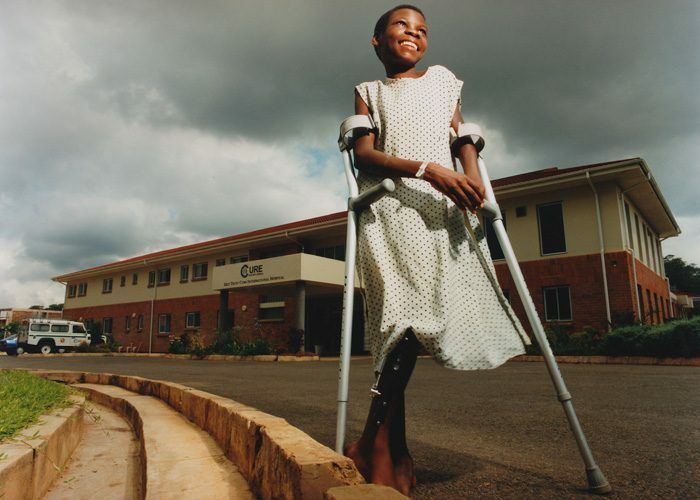 Anticipating the Centenary, the first project, the Beit CURE International Children’s Hospital in Blantyre, was actually completed in September 2002. The hospital is managed by CURE International, an American charity which pays the running costs as their contribution to the project. The hospital has two operating theatres and can accommodate 70 handicapped children. 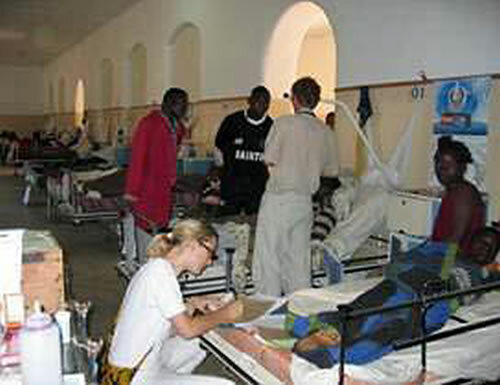 A second Beit CURE children’s surgical hospital, at Lusaka, Zambia, was opened by the then First Lady, Mrs Maureen Mwanawasa, in December 2006. It is now recognised as a leader in several paediatric surgical procedures. Unlike the Malawi hospital, which is constructed as one major building, the extensive facilities of the Zambian complex are built in a fan-shaped arrangement around the Administration and Education block, and continue to grow on land donated by the Government of Zambia. Given continuing uncertainties in Zimbabwe, Trustees have decided to keep under review the commitment of funds for the construction of a major project. All grant enquiries should be directed to the Beit Trust Representative in Harare. His email address is africaoffice@beittrust.org.uk. The Beit Trustees meet in London twice a year. Completed applications to be considered at their June meeting should reach the Beit Trustees’ Representative in Harare no later than 31 December. Applications to be considered at their November meeting should reach the Representative no later than 31 May. The Representative is helped in his work of processing applications and supervising grants by knowledgeable local people, known as Correspondents. These Correspondents, of whom there are at least three in each country, help the Trust on a voluntary basis. Twice a year, shortly before the Trustees’ meeting, they meet to discuss the applications for grants and make their recommendations to the Trustees. Favourable consideration is given to organisations which demonstrate a degree of self-help, long-term sustainability, and an ability properly to administer the funds provided. An application for a Beit Trust grant must include a brief description of the institution concerned, and a reliable estimate of the cost of the project. It should also state precisely how much money is being sought from the Beit Trustees, and for what purpose. Simple sketches of envisaged structures should accompany the cost estimates. Applicants should bear in mind, however, that Trustees are invariably faced with applications for funds greatly in excess of what can be given. Assistance with education is very seldom given below secondary school level. Applications must prove sustainability, public benefit, cost-effectiveness, and a serious commitment to education, health, welfare and/or the environment within the beneficial area.